Ageless Venomous is the fourth (black fourth domain - lol) album of this Brazilian band. These guys have really found their way with this album. They are not human, maybe banished from Planet Krisiun they've chosen to come on Planet Earth with just one insane cause: their perpetuation. It is one of the best Death Metal album I've ever heard. It goes straight next to top classical like Legion from Deicide and Blessed are the Sick form Morbid Angel or Butchered at Birth from Cannibal Corpse. Any question ??? Krisiun respect and have also some deadly touches of 80's classical bands like Venom, Slayer, Kreator or Protector but even more intense. This album kills and kills again.The cover is great, the production is enormous and clear. The double bass (sounding almost inhuman) beats are put forward in such a way that you get almost disgust by the all the bpm. 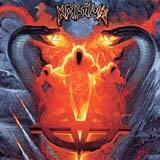 Were all there colleagues are slowing down Krisiun accelerate (is this possible ?) the rhythm and with a brutal and creative style they are bringing out a hammering and powerful piece of masterwork in the history of Death Metal. Long live the Death... And see you guys again in Wacken.